WordPress folks, YOU ROCK! 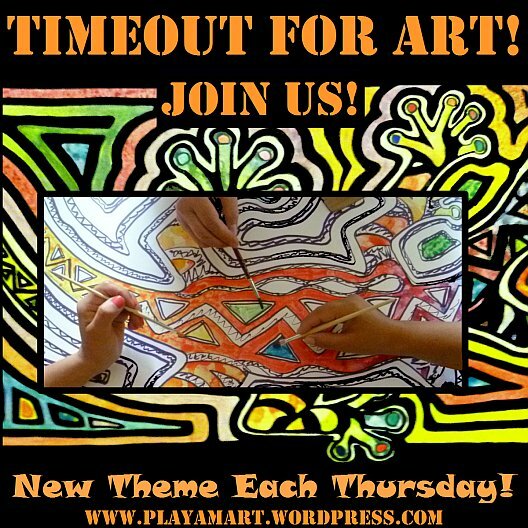 You quickly steered the once-a week drawing theme into an amazing community project! It’s going to be so much fun to see what people draw each week, and to witness the team spirit as we compare notes and swap philosophies about art. 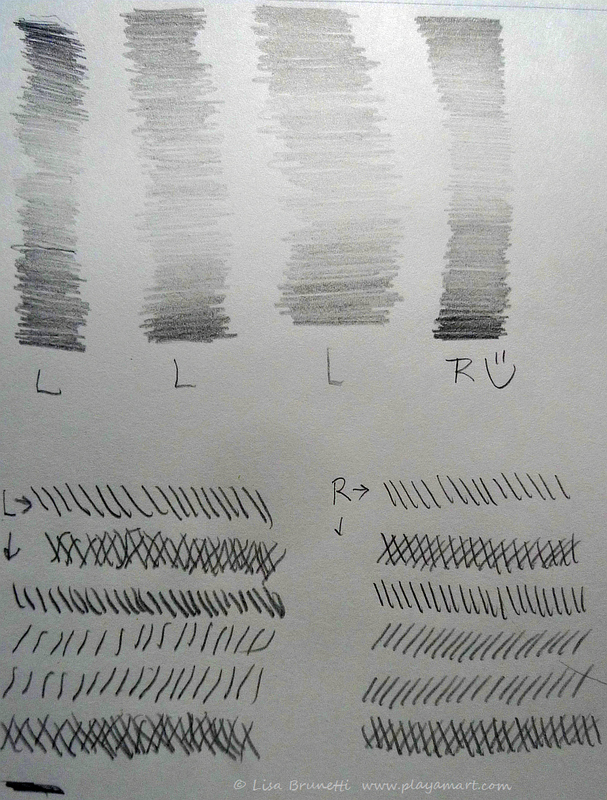 I encourage any of you that would like to test the waters – if you’ve never attempted to seriously draw, give it a try! Others might have let their talents atrophy; pick up that pencil and fight to reclaim your gift! On Sunday I walked to the little beach community of La Division, and while waiting on lunch, I selected a potted plant near the steps to the restaurant, set it on the table and began this drawing. Nelly, the owner, scowled at me and said that the plant was ugly, but then she looked at my drawing and changed her mind! I always encourage my students to spend five or ten minutes warming up. Like any athlete, it’s good to prep the body and spirit for the task at hand. You can see that my first attempt at left-handed warmups was quite spastic; the next line was much easier, and the third one looks as if were drawn by a different person! The left-handed cross hatching (above) looks quite spastic as well! I enjoyed doing the warmups and recommend that everyone try those brain-strengthening exercises! 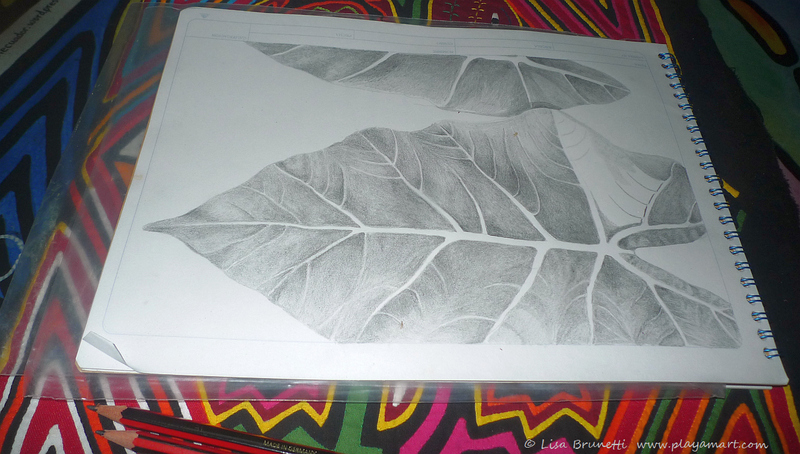 The botanical sketch is almost finished; in no hurry, I work on it when I have spare time and find that I get a bit dream-like lost in the shading. I actually fell asleep while shading today, so with a smirk, I put down the paper and stopped! (Tomorrow I will upload the finished drawing in addition to the left-handed sketch, but for now, we have this week’s “Community Drawing” link: Timeout for Art: Through A Child’s Eyes. Visit Peace, Wisdom, Prosperity for a heart-warming ‘first pencil drawing’ for this week’s Timeout for Art! thank you, and you definitely are a team motivator! thanks so much! sleep well, it’s lights out for me too! Brilliant quote. Another sleepless night, Lisa! The quote made me laugh so loudly! I have been thinking something along those lines for a post I am planning on colours; but only thinking. I am too tired to do anything about it at the moment. The builders have been here all day. It’s the artist’s role to show the rest of the world what they are missing! Good luck with this project — given your snail-like computer! i love it, and totally understand the humor in the title! bad storm? hmmm, i’m thinking that my friend barbara had something to do with that, though she’s whirling around north of you. i’ll have to check a satellite image. thanks for a great funny and well-drawn image! 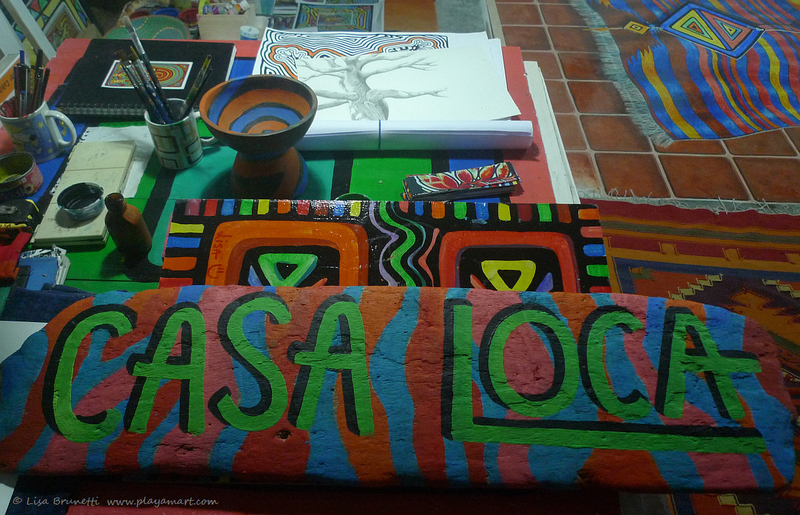 Casa Loca, I like that. Wonderful drawing cannot wait to see it. Went to Penny’s site. what a testimonial for listening to your inner spirit. This is a wonderful challenge…because it is personally fulfilling. Great quote…out of the mouths of babes. yes, the quote was so funny, and penny is a jewel. what a kind and generous heart she has! As so many others have noted, love the quote! Love your daughters thoughts about drawing. Oh, amiga! This may be my first and last time. This is way hard! Thank for you for these tips Lisa, I actually never once thought about warming up! I shall give it a try 🙂 I absolutely love the shading on the leaf, it is out of this world! Thanks for mentioning my post although I think it is nothing close to what I want it to be…but the keywords here are passion, and desire, and drive, and inspiration. This community will give each other a helping hand on all of these aspects 🙂 Thank you for being YOU! Thank you as well! I’m sorry that I’ve had so little time online this past month to stay current with the wordpress family. i’m in quito for another few days as i finish the project with friends, and then to the amazon where there’s no internet.. by mid july i should be back to a ‘normal’ life.. what’s normal? i rejoice that each day is different! Normal? I don’t know, I never heard of it sorry 😉 You live a truly extraordinary life! *BIG SMILE* I love it !! Don’t worry, we all have our duties to fulfill aside from wordpress.I also have been caught up in mine. We [luckily] can only live in the NOW, consequently, we can’t be everywhere all the time. I guess that’s what makes our “duties” so worthy, since they are exclusive to a single moment in time! Let’s enjoy them,…every second of them 😀 Can’t wait to see what ensues from this amazon journey ! G’day Lisa, well where did the last 7 days go to? So here I go again, thanks for the tips and love your quotes. I enjoyed looking at all the other sketches too. Good idea putting them all together. you did an AMAZING work of art! thanks so much! it’s lovely! I know I forgot… I need to pick up that pencil 🙂 Thank you, z! This is once a week, and we all get to work along and share? I’m in! yay! yes yes yes! i’m back at my hotel room to charge the camera batteries and am so glad to see your comment! it will be great to help/encourage/cheer anyone who wants to present a drawing each week. after a few months of drawing, it will be fun to see if everyone will wean to painting!